There were fifteen reasons to visit the International Museum of Dinnerware Design’s special 3-day-only exhibition, Dining In Dining Out. It was a true celebration of dining experiences guaranteed to make the viewer smile. 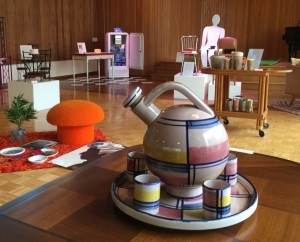 Fifteen dining vignettes were presented free to the public April 13-15, 2018 in the beautiful Mid-Century Modern events space, part of the Stone Chalet at 1917 Washtenaw Avenue in Ann Arbor. 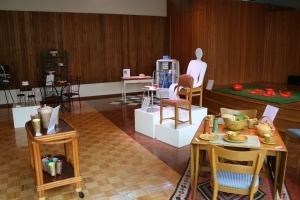 The free public reception was Friday evening 5:30-7:30 p.m. Each minimalist vignette was intended to remind the viewer of a memorable dining experience. 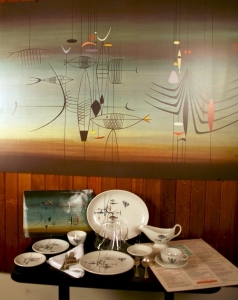 Glidden Pottery is a unique stoneware-bodied dinnerware and Artware that was produced in Alfred, New York from 1940 to 1957. Glidden Pottery utilized modern production methods of slipcasting or ram pressing, but each of the more than 300 shapes was individually glazed and hand-decorated. Most pieces were marked with a Glidden Pottery signature or backstamp that varied over the years. There was a market in the United States, especially after World War II, for everyday, yet affordable, yet chic goods such as Glidden Pottery. With a 16-piece undecorated starter set selling for $14.50, acquisition of Gliddenware was a reality for many. The founder of Glidden Pottery, Glidden Parker, had been a special graduate student at the New York State College of Ceramics during both the academic year and the summers from 1937 to 1939. His professors included Miss Marion Fosdick and noted industrial designer Don Schreckengost. 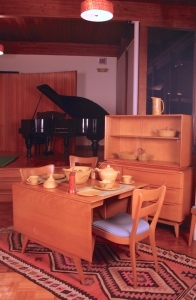 The Glidden Pottery is a perfectly matched with the Heywood Wakefield furniture of the era. Peter Max was born in Germany in 1936. He came to the United States with his family in 1953 and studied at the Art Student’s League, the Pratt Graphics Art Center and the School of Visual Arts in New York City. In 1967, the Iroquois China Company introduced the pattern, Love, which was designed by Peter Max. Love was described as a “psychedelic style splashed across” Iroquois China plates, mugs and bowls. The pattern was part of the Iroquois China Cliff-Dwellers line in the colors blue, red, yellow, and green. The Peter Max dishes were donated by Linda Arbuckle. The 10” Love ashtray was an IMoDD purchase. 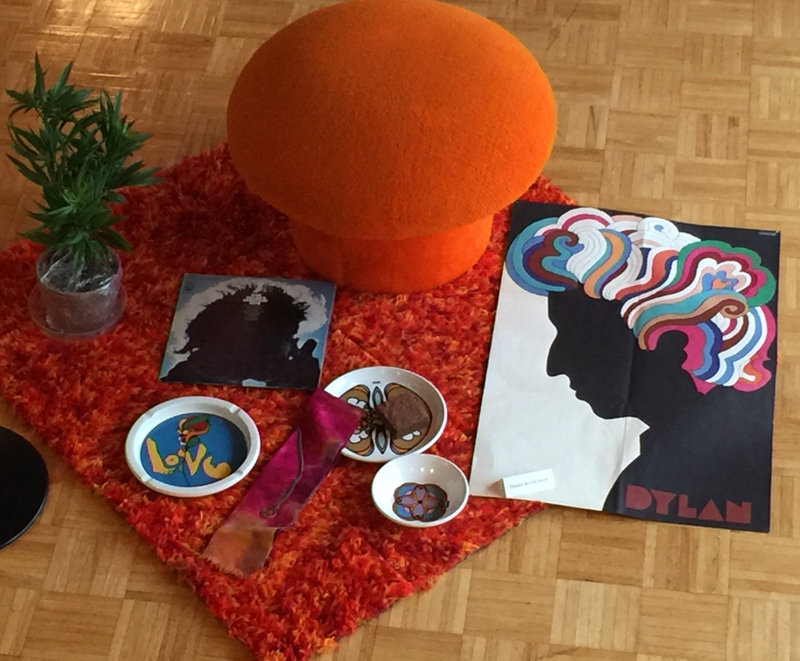 The orange mushroom stool dates from 1969-1970, as do the original Softstik Shagees carpet squares, the peace symbol necklace, tie dyed sash, and Bob Dylan poster and record album. The faux marijuana plant is of unknown origin. This 1958 Philco Predicta television appeared in someone’s living room several years after airlines first began serving frozen dinners to their passengers. The invention of the TV dinner, served in homes in front of TV sets beginning in the 1950s, has been claimed by several Swanson relatives and employees. Apparently there is no doubt that the clever advertising name of “TV Dinner” originated with the Swanson brand. Of course each meal was pre-packaged and frozen in an aluminum tray and placed in an attractive box featuring the individual servings of tasty-looking turkey, potatoes, vegetables, and sometimes soup or dessert. They were heated in the oven at home. The beauty of the TV Dinner was that one could consume it directly from the aluminum tray. The box and aluminum were deemed disposable and there was no advanced meal planning, no leftovers, and there were no dishes to wash. Basically, they were fun. Swanson added desserts such as brownies or cobblers to their TV Dinners in 1960, and they offered “Hungry-Man Dinners” in 1973. Microwave safe trays were introduced in 1986. Swanson wasn’t alone in marketing TV Dinners. The other major brand was Banquet. “Lassie” may be in re-runs now, but it was a television staple in 1960 when this TV Guide was published. 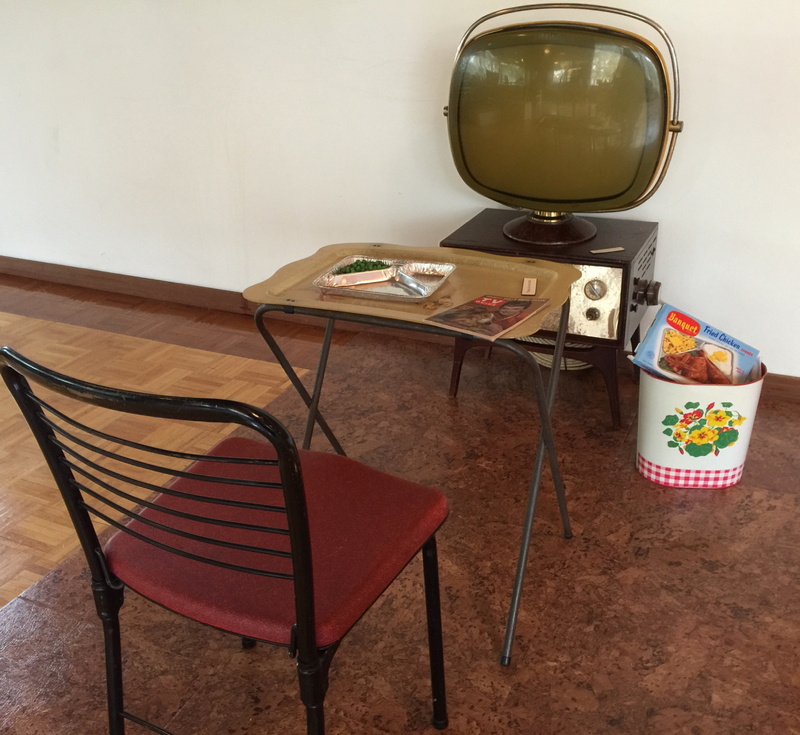 High chairs have been used for feeding older babies and young toddlers for centuries. Such specialized chairs make it easier to feed and tend to the infant’s needs. The Metropolitan Museum of Art has a high chair in its permanent collection that dates to around 1700 and is constructed of maple and hickory. It was donated to the museum in 1909. 18th and 19th century examples can be found in quite a few museum collections. What is most interesting about each high chair, is that just like adult-size furniture, children’s pieces follow the fashions and trends of the era in which they were made. There are 18th century high chairs in the old-fashioned Windsor style with nicely turned legs, rails, and stretchers, and a shaped seat. There were no trays on high chairs until around the 1950s. 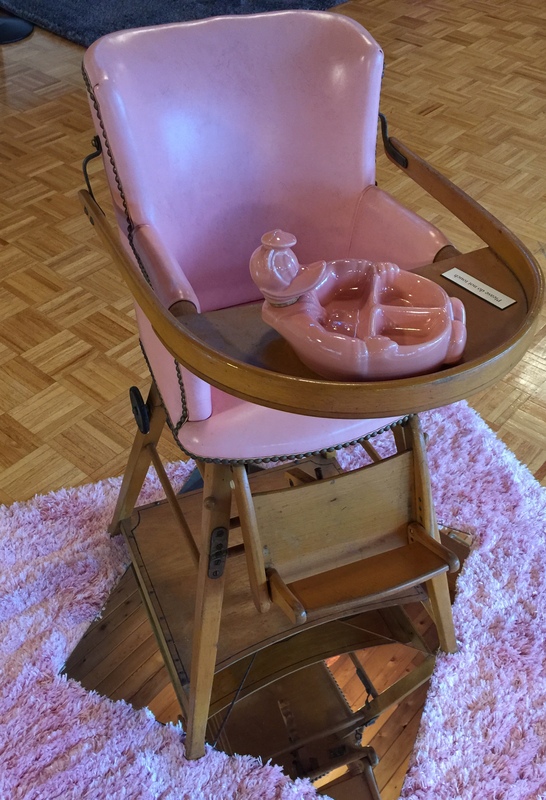 But from early times there is usually a foot rest and some kind of strap to help hold the child in the chair. Another style sometimes referred to as a Victorian high chair in the 19th and 20th century, frequently is “convertible”. Some could be converted to chair-and-table combinations, and others into rocking chairs, or wheeled walkers. Styles of chairs might be referred to as of the Eastlake-style or something similar. The original owner of this deluxe pink upholstered high chair is unknown. 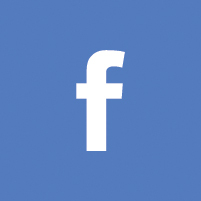 It was purchased by IMoDD in Livonia, Michigan. It probably dates from the 1950s. It is a convertible model, that becomes a wheeled walker. It has delightful colorful decorations which remain hidden until the high chair has been converted to a wheeled walker. The focus of this vignette is actually the Hankscraft baby food warmer from the 1940s or 1950s. This baby-girl pink ceramic feeder, in the shape of Donald Duck floating on his back, was meant to be filled with hot water to keep the baby’s food warm in the era before microwaves. Marshall W. Hanks founded Hankscraft in Reedsburg, Wisconsin in the 1940s. He received the patents on his products and then contracted this one out to Redwing. Hankscraft also made ceramic humidifiers and bottle warmers in addition to clowns and Humpty Dumpty-shaped baby food warmers. Dining is never truly finished until the midnight craving for just a bite of this and bite of that occurs and the fridge in the kitchen is raided for leftovers. This 1948 Fridgidaire was made by General Motors and vintage advertisements show it crammed full of food and beer. Don’t you think it looks better with leftovers in dreamy blue refrigerator ware made by Hall China “exclusively for Westinghouse”? The “best” are Art Deco streamlined from the 1930s such as the water pitcher, ca. 1938. The color has been described as delphinium blue or periwinkle blue. Or even Westinghouse blue. 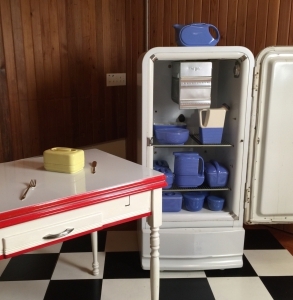 There were three basic categories of Hall refrigerator ware, including covered water containers or servers, boxes for leftovers, and covered butter dishes. The butter-colored covered butter dish on the table is to remind you that a year from now IMoDD will be presenting “Butter,” an invitational, juried and historical exhibition featuring the creamy butter theme. This upcoming exhibition will be a partnership with the Washtenaw County Historical Society and will be on view at the Museum on Main Street in Ann Arbor. 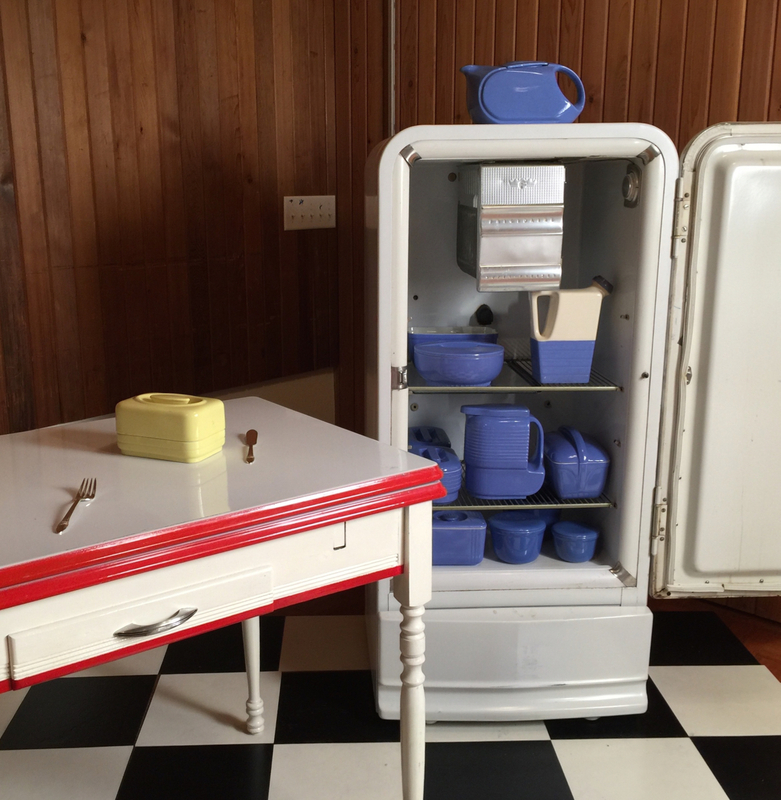 The refrigerator ware was donated by Vicki Matranga or purchased by IMoDD. Our Cunard White Star Line Queen Mary vignette features an English Foley China tea service that may or may not have ever been used on the Queen Mary, along with an original folio 1936 Queen Mary brochure and a Cunard 1937 embossed breakfast menu. This deck chair was definitely never on the Queen Mary. This rare bone china tea service, manufactured in England by Foley China, was part of the experience of dining on the RMS Queen Mary, part of the Cunard Line, which sailed primarily on the North Atlantic Ocean from 1936 to 1967. The set consisted of a small teapot with a lid, demitasse cups and saucers, creamer, and sugar. 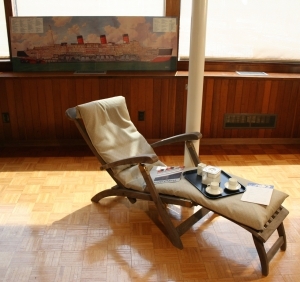 It is said that the Queen Mary and her sister ship, the Queen Elizabeth, dominated the transatlantic passenger transportation market until the dawn of the jet age in the late 1950s. The Queen Mary was retired in 1967 and is now permanently moored at the port of Long Beach, California. Robert Crawford Johnson designed this cube teapot and registered the design in 1917. The teapot was dripless and poured easily. The cube shapes were chosen for use on the ships because of economies in stowage and reduction in breakages according to the written records of the day. The cube shape eliminated fragile spouts and handles. A number of English companies supplied the roughly 30,000 pieces that comprised the china table service on board. This cubed tea service was an IMoDD purchase, 2014.159. 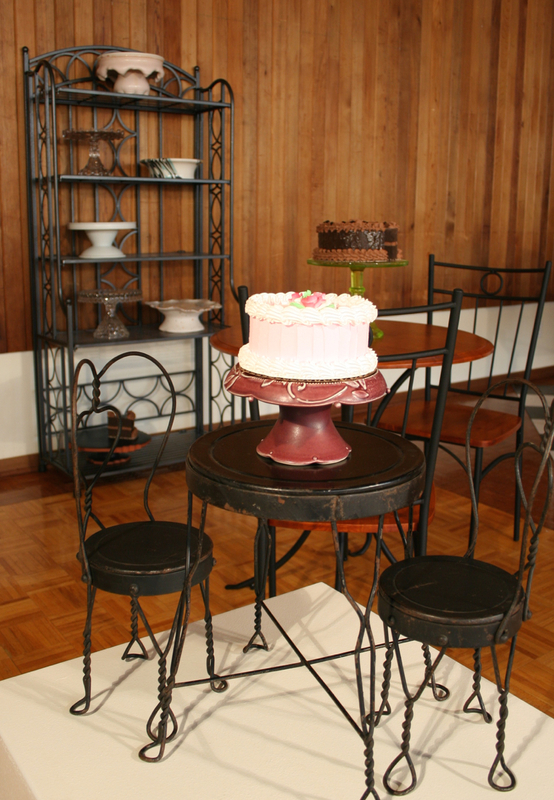 This vignette is a memory of IMoDD’s 2016 exhibition Cake, which popped up at the Washtenaw County Historical Society’s Museum on Main Street. 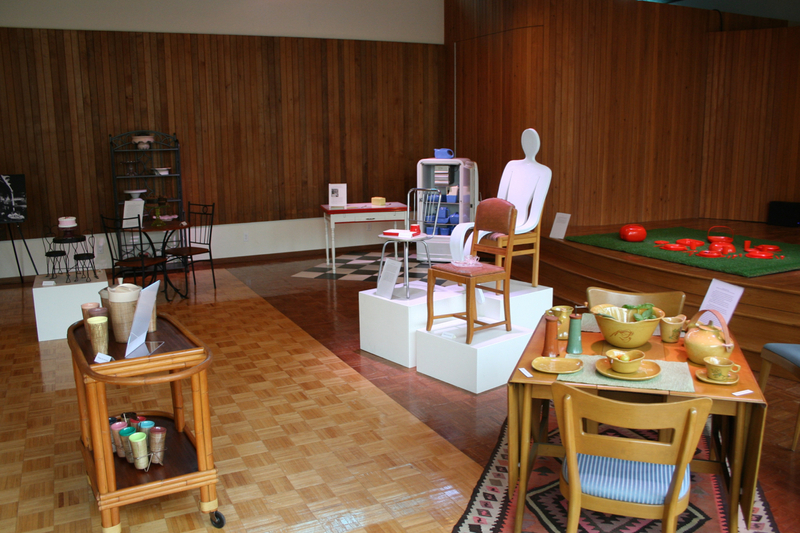 The exhibition featured a juried and invitational exhibition of contemporary cake stands and sculpture, as well as a selection of vintage American glass cake stands. The history of cake dates back to ancient times. The first cakes were very different from what we eat today. They were more bread-like and sweetened with honey. Nuts and dried fruit were often added. According to the food historians (www.foodtimeline.org), the ancient Egyptians were the first culture to show evidence of advanced baking skills. The Oxford English Dictionary traces the English word cake back to the 13th century. It is a derivation of ‘kaka,’ an Old Norse word. According to the food historians, the precursors of modern cake (round ones with icing) were first baked in Europe sometime in the mid-17th century. This is due primarily to advances in technology (more reliable ovens, manufacture/availability of food molds) and ingredient availability (refined sugar). The first icings were usually a boiled composition of the finest available sugar, eggs whites and (sometimes) flavorings. This icing was poured over the cake. The cake was then returned to the oven for a while. When removed, the icing cooled quickly to form a hard, glossy (ice-like) covering. Many cakes made at this time still contained dried fruits (raisins, currants, citrons). It was not until the middle of the 19th century that cake as we know it today (made with extra refined white flour and baking powder instead of yeast) arrived on the scene. The Cassell’s New Universal Cookery Book (London, 1894) contains a recipe for “layer cake, American” (p. 1031). Butter-cream frostings (using butter, cream, confectioners sugar and flavorings) began replacing traditional boiled icings in the first few decades of the 20th century. The late 19th-early 20th century American glass cake stands exhibited include a fine example of a Uranium glass pedestal cake stand which fluoresces under black light and causes activity with a Geiger counter. 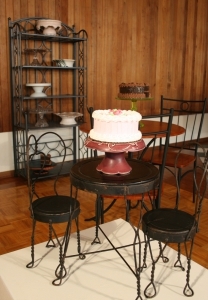 The contemporary cake stands were created by the artists Aysha Peltz, Mary Louise Carter, Kristin Kieffer, Kate Tremel, Paul Eshelman, and Dgnait Moreno and are now part of the permanent collection of IMoDD. 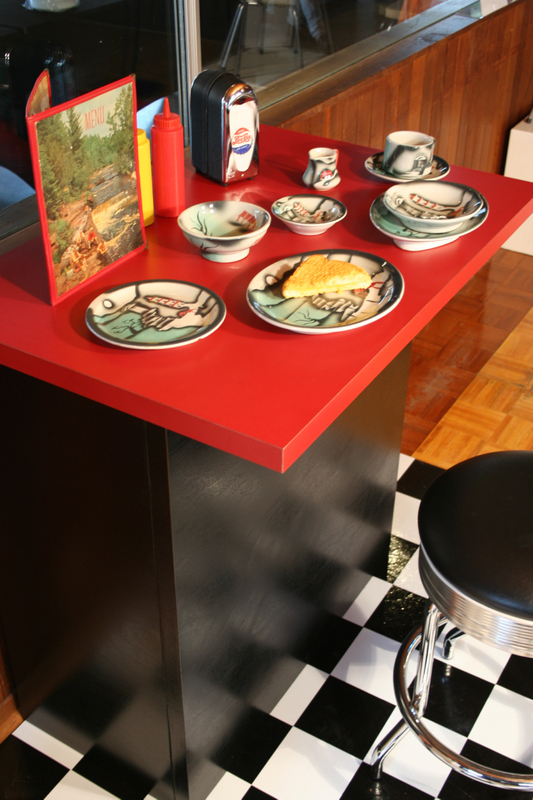 These two child-size dining vignettes represent two snapshots in the evolution of children’s play dining. It can be assumed that toys dishes have been played with by children as long as there have been sea shells, leaves, and other vessels used for the consumption of food and beverages. 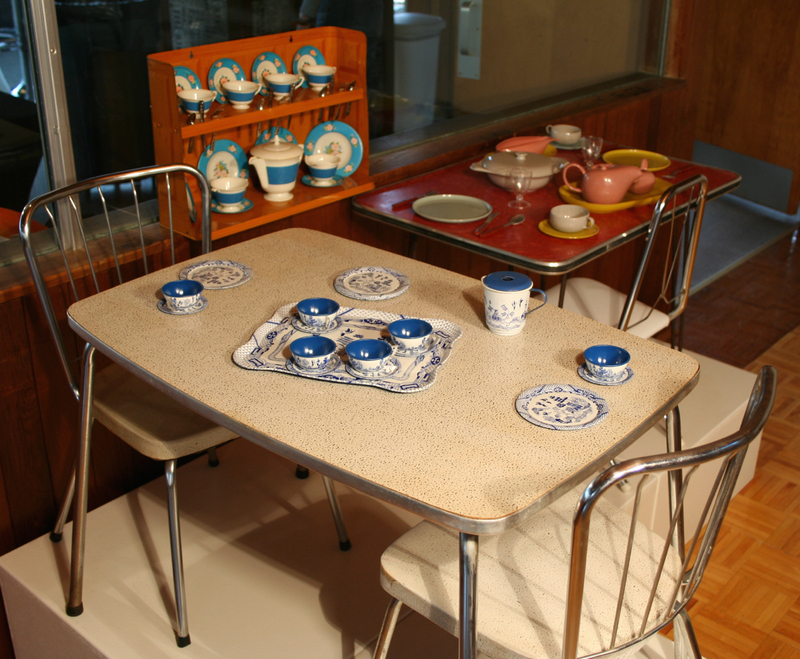 Dating from the 1950s, Ohio Art created this 21-piece Blue Willow pattern child’s tin litho tea set for play. The original box which came with this IMoDD purchase noted it as a “Tea Service Deluxe Set.” The Ohio Art Company, still located in Bryan, Ohio, was started by a dentist named Henry Winzeler in 1908. They produced lithographed metal tea sets in the 1920s and 1930s, but between 1942-44, they stopped toy production and converted to making war products. Toy production resumed in 1945 when war restrictions on steel were lifted. Everyone probably knows they produced the famous “Etch a Sketch” beginning in the 1960s. Of course the Blue Willow pattern on this child’s tea set mimics adult-sized Blue Willow which has been a popular motif on dinnerware for over 200 years. The English company Minton is credited with the first production of this pattern in 1780 on transferware. The story told of the derivation of the Blue Willow pattern is that there is a Chinese fable of a couple eloping who were transformed into doves. This pattern was based on a rather timeless popular design motif, in contrast to other children’s formal dining implements that were based on recently popular contemporary dinnerware design. The Russel Wright (American, 1904-1976) children’s toy plastic American Modern dinnerware set was created in 1959 by the noted designer, for his daughter Annie. It was manufactured by the Ideal Toy Company, Brooklyn, New York (est. 1903). Our 58-piece set consists of plastic dishes, stemware, and flatware, all modeled on the adult-sized ceramic American Modern dinnerware that was extremely popular and manufactured between 1939-1959 by Steubenville Pottery. They were apparently sold through Sears, and a small tea for two initially sold for 79 cents! What child didn’t want to own a set “Just like Mommy’s”? Some sources note that the stemware and flatware may not have been designed by Russel Wright. This set was one of the first acquisitions purchased for IMoDD in 2012, and accessioned as 2012.36. One furniture company, Ritts of Los Angeles, captured the allure of rattan during the mid-twentieth century. The company’s furniture designer was Herb Ritts. His wife Shirley was in charge of sales and marketing. The company produced popular patio furniture including dining tables and chairs, lounge chairs and end tables, and, of course, bar carts such as this. The Tropitan line of rattan bamboo furniture proved very popular in its time and is now highly collectible. 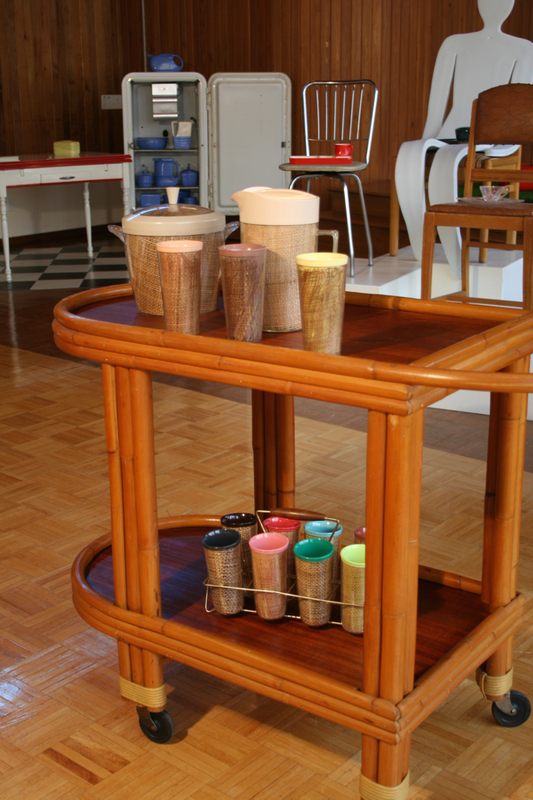 A wonderful accompaniment to the rattan bamboo bar cart is the fruit juice beverage server, ice bucket and tumblers that were created in the 1950s and 1960s from plastic/melamine with raffia inserts. Frequently referred to as raffia ware, the soft yet vibrant pastel plastic colors utilized are in total harmony with the natural bamboo and wood of the bar cart. In 1928, Schramberger Majolikafabrik located in the Black Forest region of Germany hired a young Hungarian designer who designed more than 200 pieces over the next year and a half, including this Bauhaus-inspired liqueur set. The young designer was Eva Zeisel. Considered by many to be the most inspirational designer of the 20th century, Eva Zeisel (born Hungary, 1906-2011) was a prolific designer of dinnerware (dishes, glassware, flatware), furniture, and more. Displayed on a modest late 1930s-early 1940s wooden end table, is a rare Schramberg liqueur set, including a brandy jug with a stopper (model 3366) and five beakers (model 3367), on a circular tray (model 3387), all circa 1929-1932. More about Eva Zeisel and her design genius can be explored in the book, Eva Zeisel: Life, Design, and Beauty, 2013. This liqueur set is an IMoDD purchase, 2017.181. The Well of the Sea was an acclaimed seafood restaurant located in the lower level of the Hotel Sherman in Chicago’s downtown loop at 112 W. Randolph at the northwest corner of Randolph and Clark Streets. The restaurant opened in 1948 and closed its doors around 1972. It was no ordinary restaurant. The interior was designed by artists, architects and interior designers to evoke the experience of dining under the sea. This was accomplished through the use of abstract murals and sculpture of fish, lures, and bait by Richard Koppe – all lit dramatically with black light. 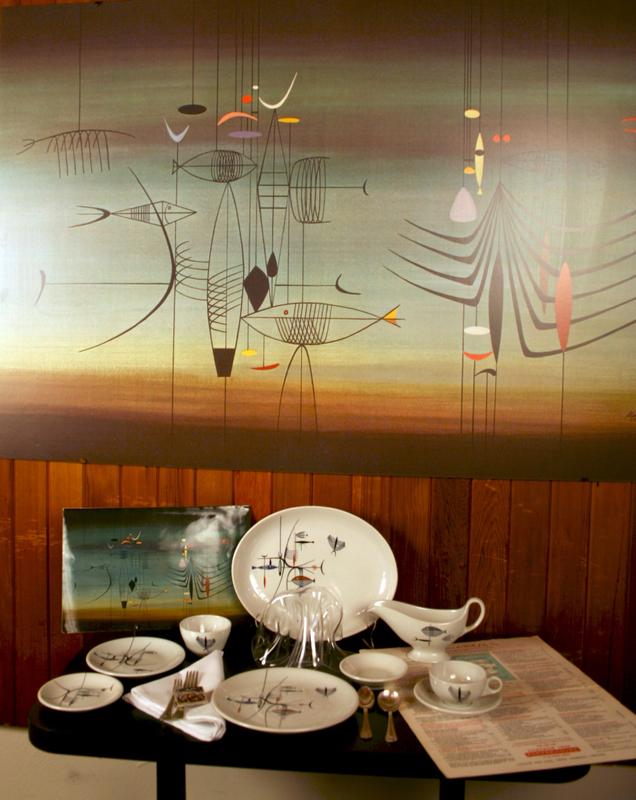 Culinary historians may be captivated by the menu – bouillabaisse, rijstafel of seafood, café diable, and flaming rum punch; Mid-Century Modern art connoisseurs have fixated on the abstract undersea murals designed by Koppe; while dinnerware collectors cannot own too many place settings of the sturdy Shenango China restaurant quality dishes with the abstract fish motifs, designed by Shenango China’s noted designer Paul W. Cook. This vignette memorializes the magic of dining at the Well of the Sea mid-century, with original menus, dishes, flatware, mural reproduction and memorabilia from the restaurant. 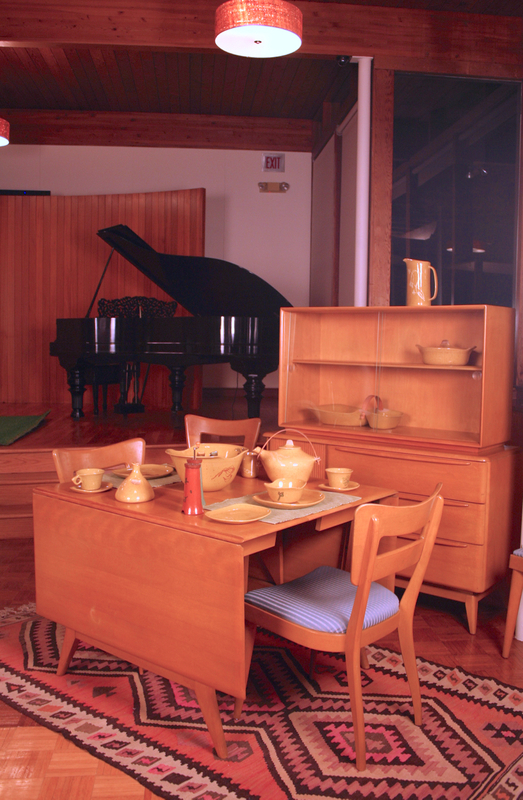 All of the dinnerware, menus and memorabilia are IMoDD purchases. All that is missing is the black lighting and oversized personalities of the day. 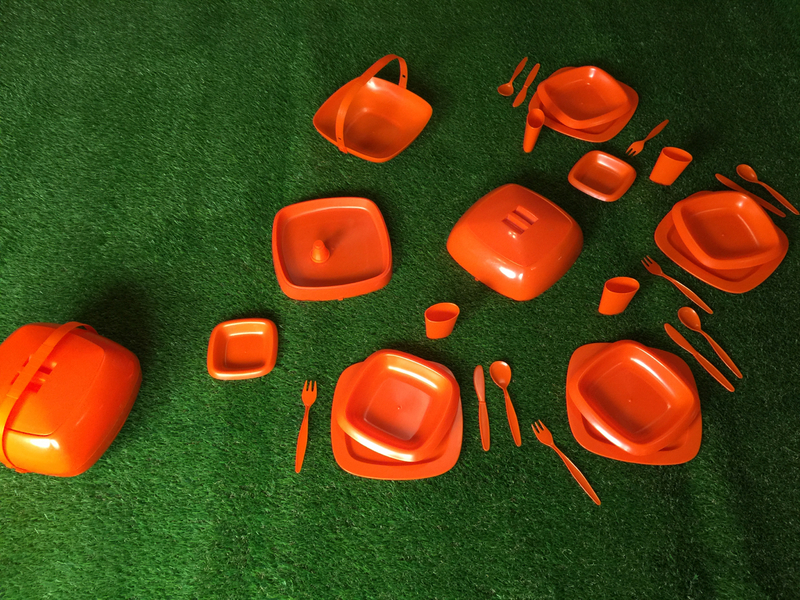 The grass may not have been greener, but it is certain that the orange plastic picnic set was oranger in 1970, if there is such a word. Available in two colors only, orange and yellow, Picnic Master must have been the most hip of all the picnic sets available around 1970. The beauty of the set isn’t just that it is unbreakable plastic. It is the compactness of the set. All 34 pieces fit neatly into a handled carrier which becomes a serving bowl, once unpacked. There are 4 entrée plates, 4 salad plates, 4 appetizer plates, and 4 cups. Additionally there are 4 knives forks and spoons, a salt and pepper shaker set, 2 serving bowls, one lid and a carrying handle. Another attractive feature of this compact picnic set is that is has a certain space age spirit. A flying saucer-ish picnic set for outdoor dining. Railroads recognized very early that dining was a key way to distinguish themselves from competitors. Passengers benefited from each railroad’s effort to offer the best food, best service and best dining environment. Even the china became a mark of distinction. Railroads often used unique china patterns to brand the railroad and their unique passenger routes. Union Pacific featured different china patterns for each of its premier routes and even had special china for children on certain trains. Union Pacific’s famed “City” trains, such as the City of Los Angeles or City of Denver, all used a distinctive Streamliner pattern featuring a winged locomotive. This pattern featured gold pin striping and a winged train emblem that ranged in color from rust-red to green or brown. Introduced in 1936, this distinctive pattern is still in use on Union Pacific’s private passenger fleet. Authentic railroad china is typically marked with the name of the china maker and some combination of the train name, china pattern and railroad name, logo or initials. The distinctive Streamliner designed china was manufactured by several different makers, including Homer Laughlin, Syracuse China, Sterling and Trenton. This pattern was not always back stamped, or marked on the back with the maker, but when it was, it included the name of Union Pacific R.R. 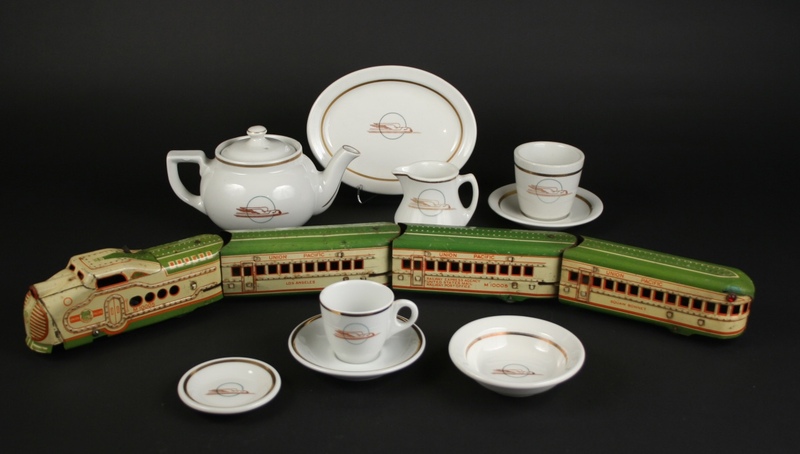 Railroads carried thousands of pieces of china in each passenger train, from egg cups to butter pat plates to demitasse cups and saucers, in addition to the standard plates, bowls, cups and platters. All Winged Streamliner china displayed are IMoDD purchases. The flatware is Zephyr silverplate, Band on Heel pattern, by International Silver from 1935, IMoDD purchase, acc. no. 2018.2. The toy train is a 1930s tin Union Pacific Streamliner locomotive and 3 cars. The beverage menu is dated 12/4/44, from the Union Pacific Railroad Streamliner City of Denver. Diners have been favorite gathering places for decades. 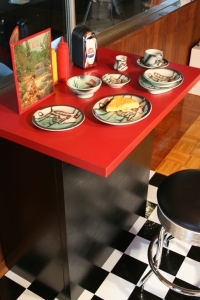 It seems like good coffee and conversation go along with the diner counter and swivel stool environment. Part of the ambiance is the sturdy restaurant china which one encounters in the local diner. Among the many makers of restaurant china (Hall China, Homer Laughlin, Syracuse, Buffalo, etc.) is Tepco (Technical Porcelain and China Ware Company) which produced commercial or restaurant ware for 50 years. Tepco is a California brand, established in Richmond in 1918 and moved to El Cerrito in 1930. At its peak it employed 200 employees and produced 30,000 pieces a day. Tepco closed in 1968, though there are still restaurants out West that use their china. Some sources say there are a million Tepco patterns. While it may only be hundreds or thousands, it is safe to say that if you think you’ve seen them all, you’ll certainly see a new one the next day. One of the largest commissions for dinnerware came from the U.S. Navy. Tepco made pieces for Trader Vic, including a Death’s Head mug for hot rum. Among the most captivating is a pattern known as Confucius, that some say was originally used in a restaurant in San Francisco. The rich color palette of greens, reds, charcoal and white are utilized in the stylized depiction of pagodas, bridges, streams, and trees. Most of the Tepco China in the IMoDD collection, which numbers in the hundreds, was donated by Nancy and Steve Selvin. A few pieces of the Confucius pattern were purchased by IMoDD. The 1950s Port Jervis diner menu (2018.53) is an IMoDD purchase. While you may not have done it yourself, it is easy to picture. Imagine a group of women gathered in a living room, chatting away, possibly smoking, while they balance a small plate with a cup of coffee or soup bowl, on their laps. These bridge sets or snack sets were popular from at least the 1930s into the 1970s. They were frequently made of ceramic or glass, in styles that were popular at the time of manufacture. Hazel Atlas manufactured many of the glass sets that were inexpensive. Noted ceramic companies such as Lenox, Noritake, and Glidden Pottery created delightful, dainty and modernistic versions. The sets included a small plate or tray, frequently kidney shaped, with a special indentation to hold the cup firmly on the tray. Sometimes there was an ashtray built into the plate or tray. Circa 1953, Glidden Pottery in Alfred, New York (1940-1957), created a stoneware version with a viridian glaze that was comprised of a triangular-shaped sandwich plate, with a lidded, winged soup bowl. Very modernistic. It was designed by Glidden Pottery’s founder, Glidden Parker (1913-1980). This is an IMoDD purchase, 2014.26. The pink swirl glass version probably dates from the 1950s (IMoDD 2013.41) and was manufactured by the Hazel Atlas Glass Company. The smoker’s snack set is from an unknown manufacturer and is a Promised Gift of Margaret Carney and Bill Walker.